The Service Pack Extended Warranty provides peace of mind and product failure protection beyond the original factory warranty period. Once the standard factory warranty for your UPS expires, should your product fail, you expose yourself to potential loss of power protection and costly out of pocket expenses for repairs. 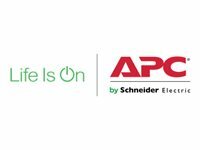 With the purchase of the APC Service Pack Extended Warranty, you will experience a seamless extension of the standard factory warranty by one to three years, depending on Service Pack purchase. The Service Pack Extended Warranty provides repair or replacement of your product and even covers your battery. WEXWAR1Y-AC-03 Features 7x24 telephone technical support - Our experienced technical support engineers are available to answer your questions, giving you peace of mind knowing the help you require is available at any given time. WEXWAR1Y-AC-07 Features 7x24 telephone technical support - Our experienced technical support engineers are available to answer your questions, giving you peace of mind knowing the help you require is available at any given time. WEXWAR1Y-AC-06 Features 7x24 telephone technical support - Our experienced technical support engineers are available to answer your questions, giving you peace of mind knowing the help you require is available at any given time. WEXWAR1Y-AC-05 Features 7x24 telephone technical support - Our experienced technical support engineers are available to answer your questions, giving you peace of mind knowing the help you require is available at any given time. WEXWAR1Y-AC-02 Features 7x24 telephone technical support - Our experienced technical support engineers are available to answer your questions, giving you peace of mind knowing the help you require is available at any given time. WEXWAR1Y-AC-01 Features 7x24 telephone technical support - Our experienced technical support engineers are available to answer your questions, giving you peace of mind knowing the help you require is available at any given time.